Never heard of Taha’a? No worries, these little islands were a mystery to me as well, until I visited French Polynesia and was lucky enough to spent two days in this little hidden paradise. First thing I’ve learnt is that Taha’a is very well-known among Hollywood stars. And here’s why. Taha’a – and its luxury hotel Le Taha’a Island Resort & Spa – is the place to experience what barefoot luxury is all about. Celebrities who are looking for a secret hideaway to enjoy a holiday away from the spotlights, one with nature but still with tons of luxury, love staying here. Taha’a and its neighbour Rariatea may once have been a single island, as they are inclosed by the same coral reef. The island is barely 90 km2 large, there are just under 5,000 inhabitants. Taha’a is also known as the Vanilla Island (for the foodies: the vanilla produced here is of exceptional quality). The island can be reached by boat (leaving from Raiatea, it takes about half an hour) or by helicopter (10 minutes leaving from Bora Bora). The lovely little church, seen from the water. The island is a little haven of peace and quiet. And to be honest: apart from visiting a vanilla- and oyster plantation and the usual island tour there’s frankly not that much to do or to visit on the island. But of course you’re here to discover Le Taha’a Island Resort and Spa and that will keep you undoubtedly very busy. The resort is located on a secluded motu near Taha’a, and the views are truly exceptional: on one side you can see Taha’a, on the other side there’s a fab view of the mythical island Bora Bora. 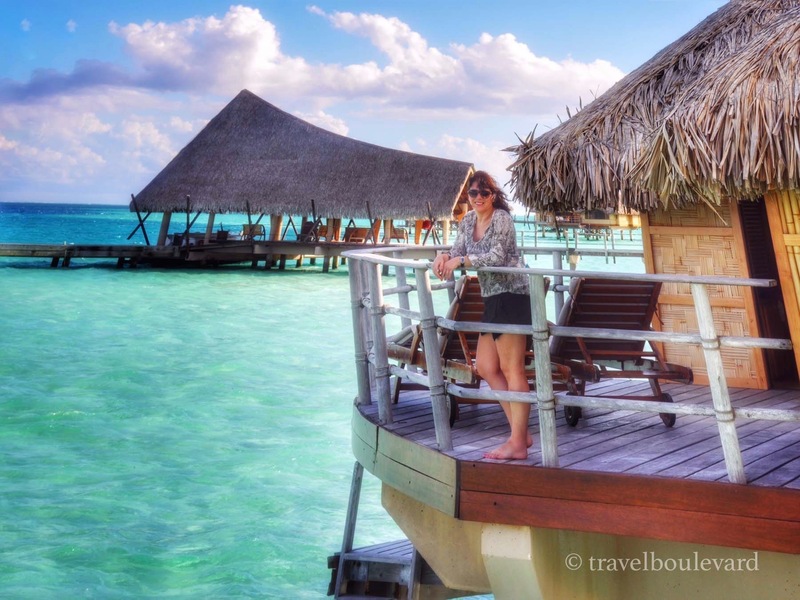 Le Taha’a is part of the prestigious Relais & Châteaux and it is a true gem, it’s the ultimate getaway with huts (or better: oversized villas disguised as huts) and overwater bungalows built in traditional Polynesian style. And important: the luxury resort exists in close harmony with the environment, nature and local culture. More bungalows over the water. Hollywood stars in my room? Le Taha’a counts about 57 suites, beach bungalows and water villas, a spa and fitness center, a swimming pool, 3 restaurants… in short, it’s everything you would expect a luxury resort to be. Or do you prefer this side? Stars like Julia Roberts, Brad Pitt and Angelina Jolie, Ashton Kutcher and Mila Kunis… they all enjoyed a stay here – they might even have holidayed in the bungalow I was staying, just imagine 🙂 – and no wonder: the thing that makes this place unique, apart from the exceptional setting of course, is the feeling to have this little paradise all to yourself. Of course the relaxed atmosphere and übersympathic and professional staff is a big plus as well. It’s barefoot luxury at its best. Another big plus: paparazzi can never find this island on their own without the help of the hotel staff or other insiders (and the island is only reachable by boat or by helicopter). Privacy guaranteed. And the mirrorselfie of course. Yes, I’m wearing flowers in my hair, because that’s what you do in Tahiti. The private deck for soaking up the sun. The ocean is at your feet. The living room in one of the beach villa’s. If you want, you could jump out of bed…straight into the swimming pool. The beach bungalows have their own, private, swimming pool. Taha’a is known as the Vanilla Island and so it’s no surprise the ingredient pops up in various foods and drinks. Have tasted vanilla cookies, vanilla cocktails, vanilla yogurt, fish with vanilla (!) … You name it. And no, I couldn’t get enough of it: the islanders know exactly how to dose the vanilla and without exaggeration: you just don’t know how vanilla really should taste until you’ve tried the Tahitian Vanilla. Apart from the vanilla dishes there were plenty of other delicious things to taste: tropical fruit and vegetables, fresh fish, sweet pastries, everything you can imagine. My favorite was the raw fish served in a coconut, simply delicious. Taha’a is know as the Vanilla Island, and vanilla is everywhere. Here it is: raw fish in a coconut, my favorite! Breakfast was great. Yes, I loved the crispy croissants, fresh mango juices and creative omelets, but it was especially the breakfast area that made me extra happy: a pretty oversized tree house overlooking the lagoon and endless ocean. Need I say more? Loving your cozy over water villa so much you never want to leave it, not even for having breakfast in a luxury tree house? You don’t have to. Stay in en keep floating around you villa- it is after all an overwater villas, the lagoon is at your feet – and order the canoe breakfast; your meal will be delivered by a small canoe and the sound of a cheerful ukulele. We didn’t try it ourselves (treehouse addicts) but this Instagram picture says it all. Start your day with a cool breakfast, ukulele music, and end it with a Zen moment with the fishes. No fishes around when I took this pictures, but in the evening though there were plenty. After dinner, when leaving the restaurant, the staff handed me a doggy bag with some leftovers. I was a bit puzzled by this: were they worried I might get hungry at night? Should I take this home with me (but I wasn’t planning of going home any time soon)?… “It’s for the fishes, you need to feed them”, they told me. So I stayed in an overwater bungalow. At the foot of my bed there was a little glass case which you could open. If you turn on the lights in your room, the fishes know you’re finally ‘home’ and they come swimming under your bungalow: it’s feeding time for them, so cool. I must admit: much more interesting than counting sheep to fall asleep. Just to get things straight: I do love all kinds of travel. Whether it is a budget or luxury trip, as long as the destination and the company’s okay, I’m genuine happy. True, these kinds of trips are pretty unique and an unforgettable once in a lift-time experience. Believe us: you won’t find much better. Meanwhile, we are planning a twice-in-a-lifetime experience because we desperately want to go back. We’re feeding our piggy bank the best way we can, hopefully we will make it back to Tahiti and her islands any time soon. The bar, perfect for you pre-dinner drinks. Omg, I so need a massage right now! 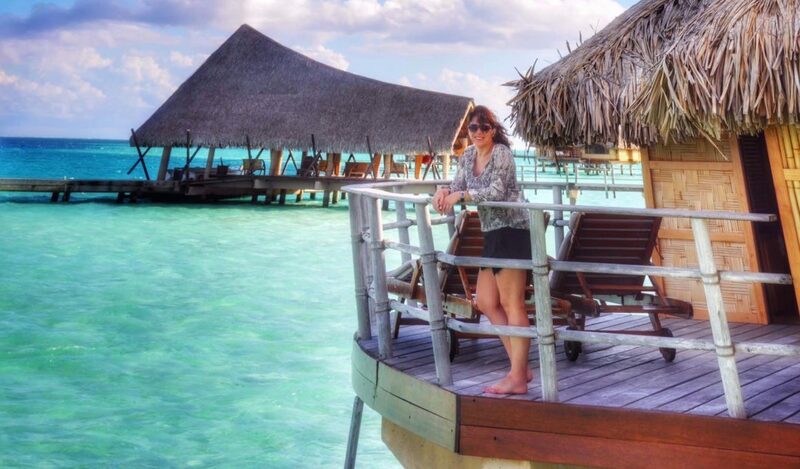 Overwater bungalows all have a dirty little secret: once you’re there, you never ever want to leave. And you keep on taking selfies. We did go on an island tour. One of the amazing views during the island tour. Things to do in the evening: watching the sunset. More information about the resort: letahaa.com – info about traveling to Tahiti: tahiti-tourisme.com. Oh my goodness, it is like dying and going straight to heaven – how utterly dreamy and gorgeous! You’re so lucky to have visited this beautiful island and I can just imagine the scent of vanilla everywhere! I would love to visit French Polynesia one day – better feed my piggy bank too!